Pioneers in the industry, we offer belt conveyors, screw conveyor, vibratory conveyor, flexible screw conveyor, magnetic chip conveyor and conveyor magnets separator from India. 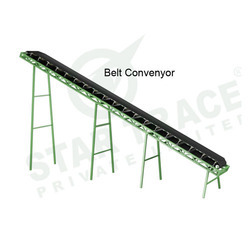 Belt Conveyors are the result of the backing by our rich industry experience in manufacturing and supplying a wide array of Conveyors that are made by using the best grades of basic components and are used extensively in mining, coal, and other industries. It can be used for horizontal as well as sloped transfer of materials. We maintain rigid norms of quality and follow well defined industry protocols to manufacture these by using state of the art technology. Screw Conveyors are samples of Our vast domain knowledge in manufacturing and supplying a large gamut of Industrial Conveyors.It enabled us to offer precision engineered Screw Conveyor to our patrons. These are offered in a plethora of sizes and other specifications and are used for handling sugar, cement, biomass, ash, refuge, food stuffs, and many more types of materials. These are used to transfer bulk materials in horizontal or inclined direction and speed can be controlled easily by changing propulsion speed. 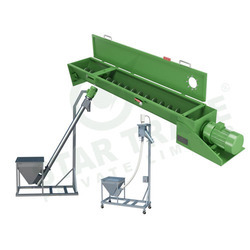 The Vibratory conveyor moves high volumes of material with low horse power requirements. Levels and orients material as it is conveyed, reducing surges to downstream equipment. They are built in 10 foot long sections which are bolted together to make up a conveyor of the required length. Odd length sections are available for use at the ends of the conveyor when the length is not a multiple of 10 feet. Counter balanced design provides an extremely smooth running conveyor with reduced foundation and support structure requirements. Our product is customized one it will change as per customers requirement. Materials such as sugar, cement, biomass, effluent, sludge cake, food stuffs, animal feed, ash, refuge, glass cutlet, granules, limestone, salt, sand, wheat and barley. 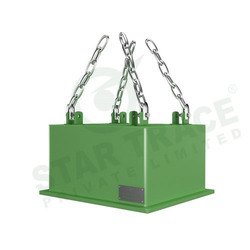 These are used to transport bulk materials in a horizontal or inclined plane. The design of the conveyor is dependent on operating conditions, the type of transported material and its properties. Traffic enforcement can be controlled by changing the speed of propulsion. Magnetic Chip Conveyor from Star Trace is one of the highly established products manufactured and supplied in excellent quality. These magnetic chip conveyor are made up of super quality raw materials, which are procured from highly established raw material suppliers. We never compromise on the quality of products. Hence, we have a team of highly qualified professionals for quality test who stringently conducts quality test to ensure excellence of products. 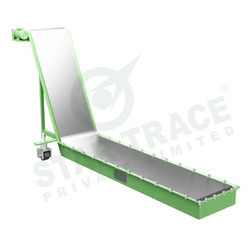 Our company offers these conveyors at very economic prices to gratify the customers across India. Hinged Steel Belt Chip Conveyor: Hinged steel belt chip conveyor has been specifically designed keeping in mind the hazards that are normally encountered with conventional chips and shaft conveyors. The hinged steel belt is pressed in extra heavy duty sheet and perfect guiding of rollers ensures minimum friction and noise free operation. The body compact in size and occupies small space but due to extra chip space can handle large volume of chips. The continuous operation ensures least machine down time and minimum labour. Application: CNC turning centres, cnc machining centres, transfer line, multi-spindle automates, spm's, heat treatment furnaces and press shops. Magnetic Plan Sheet Type Conveyor: Fine, light and sharp chips generated from gear shaves, gear Hobbes, spline cutting machines, spm's, deep hole drilling machines, broaching machines, press shops and heat treatment shops. Coming with large amount of coolant tend to escape with the coolant and cause damage to the pump and effects surface finish. Plain sheet magnetic conveyors attract ferrous chips from coolant and separates coolant from chips. Thus the coolant is free from chips and the conveyor acts as magnetic filter for the coolant. The moving permanent magnets mounted on endless chain underneath the stationery stainless steel sheet attract ferrous chips and slide them on plate to the discharge end. The coolant separated from chips flows to the coolant tank through an over flow so that even floating chips get attracted by moving magnets and get conveyed. Star trace magnetic plain sheet type conveyors being sleek in construction can be introduced into small cross sectional openings in machine tools. Since conveyors are custom built, different configuration and profiles can be made to suit specific applications. Note: Technical data and specification subject to change. Special magnetic conveyors can be made on request of customer they have to simply send us their technical data and application, required for our engineers. 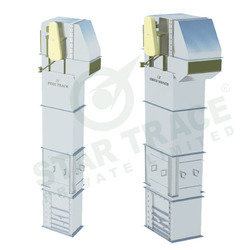 Star Trace's Conveyor magnet or Overband Magnetic Separator has been developed to handle high volume product stream flows that exceed the limitations of standard permanent suspended magnets. These models are available in both, manual on/off or automatic, self cleaning system designs. Suspension Magnets are engineered for use in high volume and deep burden applications. Their primary advantages are their "deep reach" and the ability to be turned on and off. Mounted over a vibratory bed or belt conveyor, these magnets set the industry standard for strength. Star Trace's Magnetic Pulley provides effective way to remove ferrous contaminant from powdery, schistone and granulate material, like ore, coal, waste, sand and etc. Magnetic head Pulley is composed of 360 degree magnetic core protected by rotatable stainless steel cover and a axis of rotation. In practice, surface of Pulley will be wrapped by belt, so as material flow over it. Ferrous contaminant will be attracted at belt and be conveyed out of material. In many applications, its possible to replace an existing head pulley with a permanent magnetic head pulley, on a size-for- size basis. A wide range of diameters, widths, and shaft sizes are available. New generation of bucket elevator, with observation hole and tension bridle device, has the features of high yield and stable performance. The head wheel overlying glue makes the elevating efficiency higher, low wheel with palisade structure, more effectively prevent belt sticky and off tracking. The bottom of the stand with arc shape makes few residual material, and it is more convenient to clean up. This machine is an lifting equipment widely used at home and abroad for vertical transport of all kinds of powder, granule material. ect. The bearing power can change according to the certain height. The bucket elevator can be used to transfer bulk materials or materials in pieces according to different requirements. It is widely used in mining, metallurgy, coal, food industry, chemical industry pharmaceutical industry ceramic abrasive metallurgical industry and other industries. Advanced design and excellent fabricating. High capacity with high efficiency.